Following Australian Liberal prime minister Scott Morrison's distinctly underwhelming recent pronouncement that West Jerusalem is Israel's capital but the Aussie Embassy will be remaining in Tel Aviv until a peace deal is effected between Israel and Palestine, which can then have East Jerusalem as its capital, Senator Penny Wong, the Labour opposition's Shadow Foreign Minister (who if the polls are anything to go by may fairly soon find herself the real thing in a government headed by Bill Shorten) has moved a motion on the question of Israel's capital at Labour's party conference in Adelaide. Expects that this issue will be an important priority for the next Labor Government. Calls the recognition of a Palestinian state as “an important priority for the next Labor government” providing Israel and Palestine recognise that they will live in peace and security. “I want to acknowledge that the conflict between Israel and Palestine is an issue of great importance to many in our Party. It is of great importance because Labor is a friend of Israel. I am a friend of Israel.It is of great importance because Labor is a friend of the Palestinians. I am a friend of the Palestinians. It is of great importance because we, in Labor, not only deal with the world as it is, we seek to change it for the better. And so all who have come to this debate do so in the hope of contributing to peace and to a just and lasting resolution of the conflict between these two peoples. I thank everyone for the manner in which they have engaged to propose this resolution – which I am confident reflects the collective view of this conference. This resolution makes clear the view of this conference is to continue to support the recognition and right of Israel and Palestine to exist as two states within secure and recognised borders. And it recognises the desire of this conference to recognise Palestine as a state. Labor has long supported, and continues to support, a two-state solution to the Israeli-Palestinian conflict. We support Israel’s right to exist within secure and recognised boundaries and the creation of a Palestinian state. We recognise that a just two-state resolution will require recognising the right of both the Israeli and Palestinian peoples to live in peace and security. The hallmark of Labor’s approach has been our even-handedness, and our acceptance of the legitimate claims by both parties. Labor has been consistent in its approach to working towards the resolution of conflict between Palestine and Israel. We have been consistent in our criticism of actions that undermine progress. The resort to violence or the use of disproportionate response. The construction of new settlements in areas that will become part of a future Palestinian State and the retrospective legalisation of settlements. Labor will continue to call on both sides of the conflict to refrain from any actions that hamper peaceful outcomes for both the Israeli and Palestinian people. And we will continue to ensure that any decision we take contributes to peaceful resolution of the conflict and to progress towards a two-state solution. It is an approach, which until recently, had been largely bipartisan. 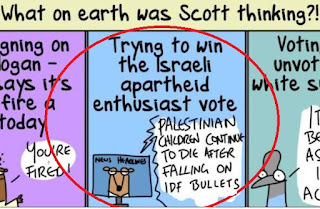 But, in a shameful act five days before the Wentworth [a constituency with a large numbr of Jewish voters] by-election, Scott Morrison put his own domestic political interest before the national interest. He made a decision to junk longstanding bipartisan foreign policy in a cynical attempt to win votes. It was a desperate political tactic. It was a decision made against the longstanding advice of agencies, without Cabinet consideration, and without properly consulting Australia’s partners and allies. Astonishingly, it was a decision made without consulting either the Israelis or the Palestinians themselves, whose agreement must be the foundation of any lasting peace. The result of the chaos and confusion has been clear. Mr Morrison has caused offence to some of our nearest neighbours, harmed Australia’s international reputation, and our nation’s interests. Ever since, the Prime Minister has been trying to escape the problem of his own creation. It is a clear example of what happens when domestic politics is put before national interest. Unlike Scott Morrison and his Government, Labor in Government will take a responsible approach to our foreign policy. We will seek and consider the advice of our agencies. We will work with our partners and allies. We will always put the national interest first. This motion makes clear Labor’s commitment to progressing lasting peace and a two-state solution. It makes clear that it will be an important priority for the next Labor Government. As Labor’s Shadow Minister for Foreign Affairs, I commend the resolution to the conference." 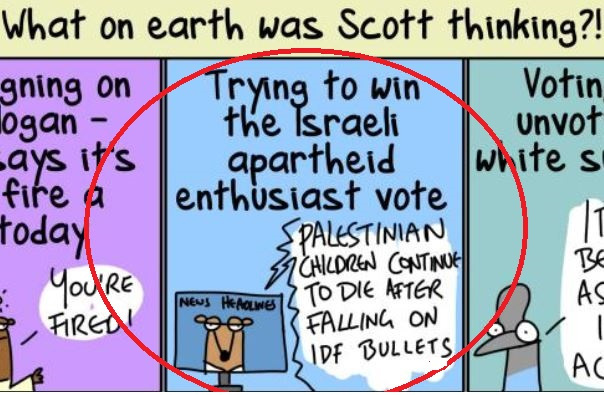 “Whilst the ALP National Conference resolution falls a long way short of the immediate and unconditional recognition of a Palestinian State which some sections of the ALP have been advocating for several years, and will not be binding on any future Labor government, the tenor of resolutions passed at recent ALP conferences has been in that direction. Unilateral recognition of a Palestinian State can only act as a disincentive, rather than an encouragement, to Israel and the Palestinians to resume negotiations, in effect pre-empting the outcome of one of the key issues to be negotiated. In contrast, recognising that Israel’s seat of government is located in the western part of Jerusalem, which is incontestably sovereign Israeli territory, does not in any way impact upon or pre-empt the future status of the contested eastern and other parts of the city captured by Israel in 1967. The ALP’s announcement that, in government, it would reverse Australia’s recent recognition of west Jerusalem as Israel’s capital was therefore hasty and ill-advised. The ALP National Conference resolution calling for recognition of a Palestinian State overlooks the reality that no Palestinian entity presently exists which meets even the most minimal of the legal and practical criteria for statehood – a government capable of exercising control over its people and territor, and delivering on international agreements. To the ALP’s credit, and thanks to the leadership of ALP leader Bill Shorten, Shadow Foreign Affairs Minister Penny Wong and their colleagues Richard Marles, Mark Dreyfus, Mike Kelly and Michael Danby among others, the goal of a just and lasting two-state resolution of the Israel-Palestinian conflict remains embedded in the ALP policy platform, and this continues to represent the bipartisan consensus in Australia. Nevertheless, it is a misguided approach by advocates of unilateral recognition of a Palestinian state to place the onus exclusively on Israel for the impasse in achieving a two-State resolution of the conflict, and does nothing to encourage the Palestinian leadership to remedy their obvious shortcomings and to act as a responsible government. Instead, it rewards them for their failures. Further, Palestinian organisations have appalling records on the rights of women, LGBTIQ people and workers. The Hamas attitude towards Israel and its Jewish citizens is openly genocidal, as its notorious Charter makes all too clear. We look forward to continuing to work constructively with Bill Shorten and his parliamentary colleagues to find ways by which Australia can contribute meaningfully to a two-State outcome, based on an honest understanding of the realities of the conflict in all their tragic complexity. “Too few of Israel’s critics seem to understand the Jewish determination to avoid another Holocaust, this one in Israel. Too few understand why Israel cannot and should not trust its survival to nations that stood idly by while millions of innocent Jews were destroyed. “…if Israel’s military power were ever to be diminished to the point that the combined armies of the Arab world could defeat it, I believe there would be another Holocaust. No Arab dictator who could defeat Israel and forebore from doing so would survive the continuing frenzy for jihad [Islamic holy war against non-Muslims]. And an Arab military victory over Israel – unlike the Israeli victories over the Arabs – would not result in a mere occupation or even detention of Israeli Jews. It would result in a mass slaughter, designed to rid Arab holy land of Jewish intruders. Most Jews know this, though they rarely speak of it openly."